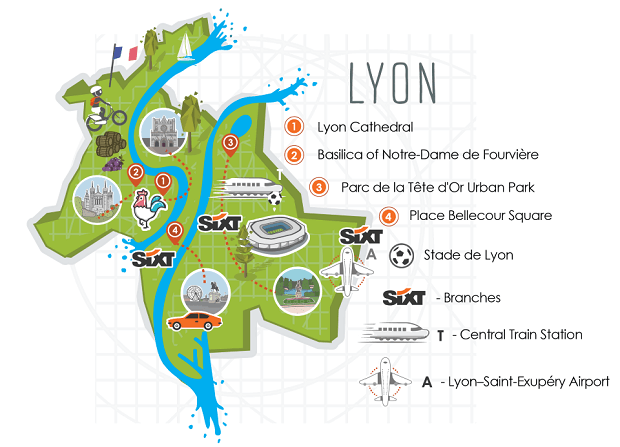 Car hire in Lyon is convenient, easy and flexible with Sixt. Not matter your group size or budget, we are sure to have the right vehicle for you from our large fleet. Make sure you check out our special offers to ensure you take advantage of our great deals, and be safe in the knowledge that you have a top-quality car hire at an affordable price. Customers can choose from a wide range of premium rental vehicles that cater for both holidays and business trips, including compact city cars, economy cars, family estates, luxury saloons and 4x4s for exploring the Rhone-Alps region countryside. We even offer convertibles and sports models so you can make the most of the great weather. With close ties to top manufacturers such as Mercedes-Benz, BMW, Jaguar and Audi, we are proud to offer top-of-the-range vehicles alongside our top-quality customer service. Available Extras: In order to maximise the comfort and convenience of your Lyon car rental, we offer a variety of extras that you can add to your booking. These include baby and booster seats, Sat Nav devices, and comprehensive insurance options, including for under 25s. As the third largest city in France and with the Historic Site of Lyon designated a UNESCO World Heritage Site, Lyon is an impressive town that has a lot to offer everyone. For arts and culture, the Musée des beaux-arts de Lyon (Fine Arts Museum) in the 17th century Palais Saint Pierre is a must-see as the main museum of the city and one of the largest art galleries in France, housing many iconic paintings from greats such as Rubens, Rembrandt, Monet, Van Gogh and Picasso. The Gallo-Roman Museum documents the interesting ancient history of the city and can be followed up by visiting the hillside Roman ruins near the Fourvière Basilica. You can also see the rare Romanesque Basilica of St-Martin-d'Ainay and the old silk quarter of Croix-Rouge. Lyon is renowned for being the French capital of gastronomy, nurturing a list of revered chefs. The perfect accompaniment to good food is on its doorstep, with the Beaujolais wine region lies to the North of Lyon and the Côtes du Rhône to the South. From the numerous old 'bouchons' around town to the to the chic, modern food market in the Part-Dieux district, you will never find yourself looking for a place to eat in Lyon! Travelling to Lyon for the Euro Cup 2016 and need insider tips for tourism, what to eat, how to drive and, most importantly, enjoying the football? Check out our useful Euros 2016 Lyon Guide!